Looking for a New Lexus NX Hybrid in your area? CarGurus has 251 nationwide Lexus NX Hybrid dealers with 1,307 new car listings. There is a lot to like about hybrid SUV offerings from Lexus, so the 2018 Lexus NX 300h changes little. A mid-cycle update adds new features and revamps the styling for this slick four-door crossover. The 2018 NX 300h carries over a specially tuned 2.5-liter inline 4-cylinder engine paired with Toyota’s two-motor hybrid system. The powertrain generates a combined 194 horsepower and sends it to the wheels using an electronically controlled continuously variable transmission (ECVT). The NX 300h gets 33 mpg city, 30 highway, and 31 combined. Electronic on-demand all-wheel drive (AWD) comes standard and uses an independent electric motor to power the rear wheels (compared to the driveshaft used in more traditional AWD systems). A pair of new drivetrain features include an electric-only driving mode that can power the car for about a mile at under 30 mph and a new “kickdown switch” to generate maximum power when the gas pedal is floored. There is some engine noise when the kickdown switch is activated; otherwise,the NX 300h provides a quiet ride. The shocks, springs, bushings, and stabilizer bars have all been refined to smooth out the ride and improve handling. The previously optional Lexus Safety System+ now a standard. It features dynamic radar cruise control, automatic emergency braking, forward-collision warnings, lane-departure alert. and auto-dimming headlights. The exterior styling changes start in the front, where Lexus’ trademark spindle grille has been reworked to flow more smoothly into the hood and fenders. The NX 300h has a distinct pattern, differentiating it from the gasoline-only NX 300. The updated styling continues with prominent LED taillights above a restyled rear bumper, a new underbody spoiler, and bigger chrome exhaust pipes. New 18-inch alloy wheels are also available. The interior changes include simplified climate controls, extra amps for faster charging, repositioned USB ports, extra sound sound-damping materials, an optional power back door with kick sensor, and an optional 10.3-inch touchscreen for infotainment control. The Comfort package adds heated and ventilated front seats for 2018, and the Luxury Package now includes electrochromic mirrors. The cabin is typical Lexus—comfortable, well-constructed, and understated. Large, round gauges add a classic air and are easy to read. An extra-large glove box and oversized console bin add plenty of storage space. Cargo volume is 56.4 cubic feet with the seats folded. 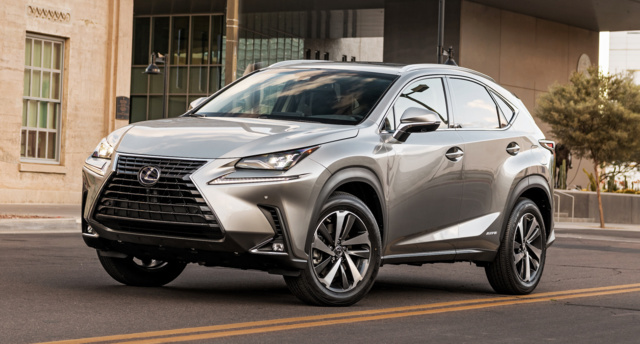 By making the Lexus Safety System+ standard, the NX 300h has been rated as a Top Safety Pick+ by the Insurance Institute for Highway Safety (IIHS) and was given five stars by the National Highway Traffic Safety Administration (NHTSA). What's your take on the 2018 Lexus NX Hybrid? Users ranked 2018 Lexus NX Hybrid against other cars which they drove/owned. Each ranking was based on 9 categories. Here is the summary of top rankings. Have you driven a 2018 Lexus NX Hybrid? Enter your zip to see incentives for a new NX Hybrid in your area. Looking for a Used NX Hybrid in your area? CarGurus has 890 nationwide NX Hybrid listings starting at $18,998.